NASHVILLE, Tenn. (CNS) — The reasons for Catholic schools to offer full inclusion of students with intellectual and development disabilities are overwhelming, according to Beth Foraker, founder and director of the National Catholic Board of Full Inclusion. They include the research showing the benefits of inclusion and the negatives of segregation of such students, she said. She made the comments during the first Inclusive Catholic High School Conference, held Oct. 23-24 in Nashville. The event brought together representatives from 12 Catholic high schools that have a full inclusion program and 12 that are considering starting one. 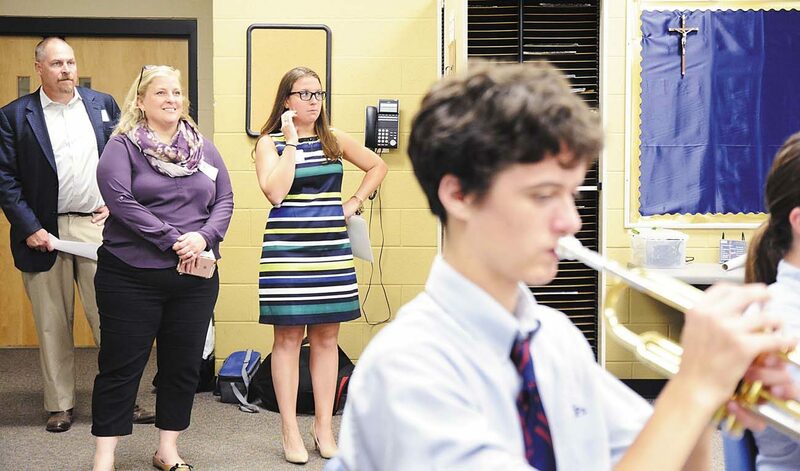 The conference’s 50 participants, who came from Catholic schools in 10 states, visited Vanderbilt University Kennedy Center and its Next Steps program for students with intellectual and developmental disabilities. They also went to St. Ann School, which this year started a full inclusion program for children in elementary school, and to Pope John Paul II High School, which has been serving students with intellectual and developmental disabilities for 13 years through its Hand in Hand program. Mike Deely, headmaster of Pope John Paul II High School, invited Foraker to hold the conference in Nashville. She agreed because it is one of only four cities that offer full inclusion programs at every level of schooling from preschool through college. The others are Fairfax, Virginia; Charleston, South Carolina; and Providence, Rhode Island. She said more Catholic schools are offering full inclusion programs. The California-based National Catholic Board of Full Inclusion helps families who have children with developmental disabilities in asking schools to serve their children and it also provides help for schools that agree to do this. The group offers free mentors to help schools and dioceses through the process of staring a full inclusion program. Mark McDowell, principal of Quincy Notre Dame High School in Quincy, Illinois, attended the conference because his school is considering offering a full inclusion program. He attended with Chris Reffet, a teacher at Blessed Sacrament School in Quincy, one of the feeder schools for Quincy Notre Dame. Reffet has two children with Down syndrome. “Blessed Sacrament has welcomed them and included them,” McDowell said. “This has given us food for thought about what those opportunities will look like down the road” when Reffet’s children are ready for high school, he added. That’s also how they feel at Bishop O’Connell High School in Arlington, Virginia, which started offering full inclusion services three years ago. It also helps improve the quality of teaching in the school, Patton said. “It makes teachers better,” he said. “They have to see and address the specific needs of every student,” which carries over to all their students, he added. During the conference, Foraker presented Deely with the organization’s Dandy Award in recognition of his leadership and support of full inclusion programs. The award is named after the dandelion, a symbol of the organization’s efforts to spread the message about the benefits of full inclusion, so it can take root in Catholic schools across the country. Telli is managing editor at the Tennessee Register, newspaper of the Diocese of Nashville.